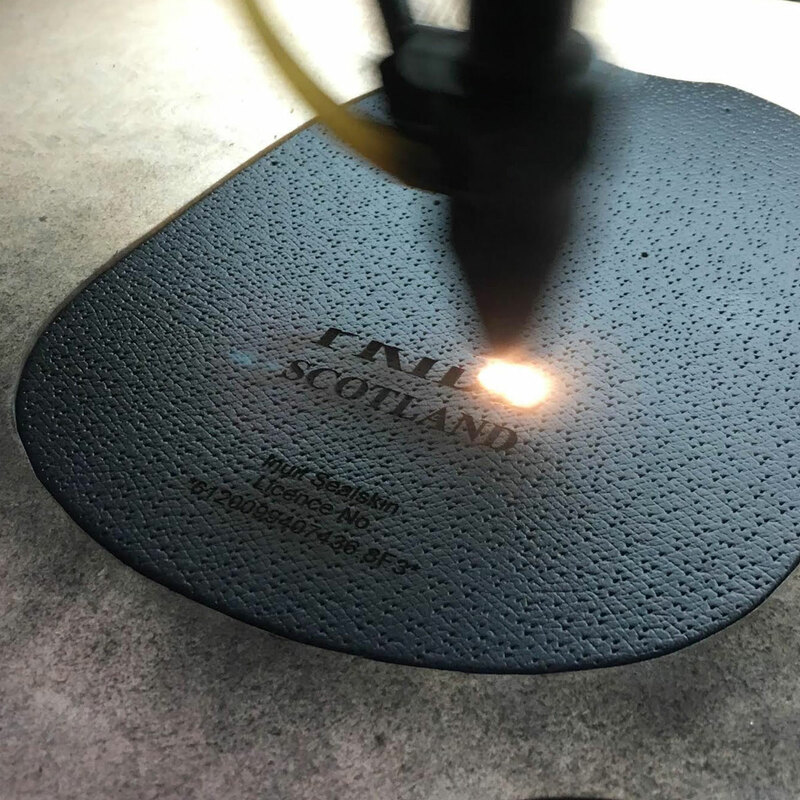 We’re really excited to now be able offer laser etching on our sporrans to make each of our handmade sporrans even more personal to you and that little bit extra special. Here’s some information on how it works and what’s possible. With a little bit of design and a really clever laser-etching machine, the possibilities for your sporran design just became infinite. We really believe the strength of handmade to order is that it’s possible for you, the customer, to tailor a design exactly as you want it. That will always be our pursuit, to provide the best experience we can to our customers. When a customer enquired about adding initials onto their sons sporran we got busy finding a solution. That solution was laser etching and we were so impressed with the result that we’ve since been working to make it possible as part of any order. Now that day has come and we’re excited to be able to say that. if you want it, we can etch it. So how does it work? Well, the process is a pretty simple one. Steven and his team make up the leather backs for the sporran you’ve ordered, which we use as the blanks. We take your personalisation request and convert it into a design file that can talk to the etching machine. If it’s particularly bespoke we’ll send it back to you so you can see how it’s going to look. The back and the design are passed on to our good friends at Etch’d and they run it through their etching machine to create your brilliant design. The back then goes back to W.E Scott and Son who do what they do best, carefully hand-making your unique sporran the same way they’ve done for nearly 100 years. When that’s all done we package it all up and get it out to you. Simple. So what’s possible? Maybe the sporran is for a special event, or birthday, and you’d like the date. Or maybe it’s a gift and you’d like to include the initials or name of the lucky recipient. Text can easily be etched into the leather to make it that little bit more special. But letters are just the beginning. The precision and detail possible in laser etching means that any design is possible and much more intricate graphics can be added to your design. We’ve done some really lovely designs that incorporate the clan crest as well as company or band logos. The possibilities don’t just end there and we love to try new challenges. Our simple day sporran is like a blank canvas and if you’ve got an idea or even a design you’d like to etch into the front of a sporran then we can work with you to make that a reality. So along with your sporran order why not consider adding a personalisation into the leather to make a really special product, perfect for you. Personalisation is available on any sporran (or anything to be honest) and you can add it in the basket stage when you order. So why not browse our sporrans, or design your very own with our custom sporran builder and personalise it however you like, the only limit is your imagination!